Last season, it took 163 games to decide the winner of the American League Central. The Detroit Tigers had a three game lead with four games left, but were unable to hold it as the Minnesota Twins forced a tiebreaker. In a game for the ages, the Twins defeated the Tigers, 6-5. Alexi Casilla’s 12th inning walk-off single dramatically sent the Twins into the postseason. Unfortunately, the Twins were unable to make it past the first round of the postseason. The Metrodome would give a slight advantage to the home team, but this April, Target Field will become the new home of the Minnesota Twins. Last year, the Twins ranked fifth in runs scored (817); it’ll be interesting to see if their new ballpark will benefit pitchers or hitters. 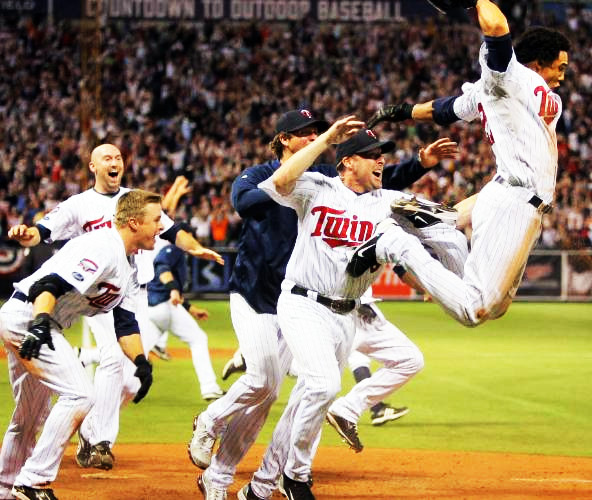 Either way, the Twins have a scary lineup that includes the American League MVP and batting champion, Joe Mauer. Along with Mauer, the Twins have several players who are capable of hitting 20 or more home runs: Justin Morneau, Jason Kubel, Michael Cuddyer, and their newest addition, Jim Thome. In addition, the Twins acquired a new double play combination: J.J Hardy and Orlando Hudson. Pitching is the Twins biggest question mark. Joe Nathan, a top-notch closer, has been sidelined with an elbow tear. Scott Baker and Kevin Slowey will anchor the rotation, but the Twins would like a comeback from Francisco Liriano, who had a phenomenal rookie season. Liriano has been plagued with injuries and struggles since 2006. The Tigers made headlines when they traded Edwin Jackson and Curtis Granderson for Max Scherzer, Daniel Schlereth, Austin Jackson, and Phil Coke. While they got some key players in return, losing a player of Granderson’s caliber is huge. They also lost Placido Polanco to free agency. Among other off-season moves, the Tigers signed Johnny Damon to a one-year, $8 million contract. With the health problems of flame-throwing Joel Zumaya, the Tigers also signed closer Jose Valverde to a two-year, $14 million deal. Since his trade to Detroit, Miguel Cabrera hasn’t been in the spotlight, but he always has an All Star type season. Additionally, the Tigers have a solid 1-2 punch with Justin Verlander and Rick Porcello. In 2009, the Chicago White Sox made a couple trades that didn’t impact the team at the time. However, Jake Peavy and Alex Rios could make big impacts on the team in 2010. With Mark Buehrle and a healthy Peavy, the White Sox could have an impressive front of the rotation. The health of Peavy is important, but so is the health of Carlos Quentin, who has been bothered with injuries over the last few years. Over the course of the last two years, the Cleveland Indians traded most of their team to get younger. They have plenty of prospects (Carlos Santana to name one), but aren’t likely to contend in 2010. The only “big name player” left is Grady Sizemore. While Sizemore is an All Star caliber player, the Indians have other established players, such as Travis Hafner and Shin-Soo Choo. Most of their club consists of up and coming players like Matt LaPorta and Justin Masterson. The Royals didn’t have too many bright spots last year, but one of them was Zach Greinke. The American League Cy Young winner dominated, despite being on one of the worst teams in basbeall. Besides Greinke, the Royals have a few players they can count on. They’ve added Rick Ankiel to the outfield and have gotten some production out of first baseman Billy Butler. Joakim Soria doesn’t get too many save opportunities as a Royal, but when he does, he gets the job done. The Royals seem to be high on their third baseman, Alex Gordon. He has been bothered with injuries and so far has yet to live up to his potential.